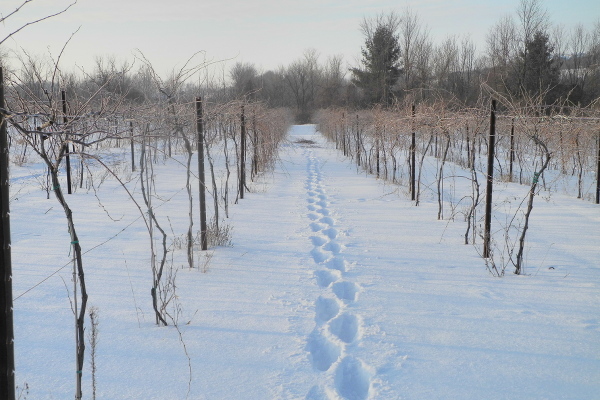 For those of you who think we only brave the cold once a winter for our Ice Wine...think again. Our staff works all winter long tending to the vines and prepping for the warmer months. Whether it's in the winery or among the vines, our staff are facing some chilly temperatures to keep the operation going. While only a small portion of our outside work in the winter is harvesting grapes for Ice Wine, a larger ongoing portion of our work is dedicated to pruning. Pruning involves cutting back the previous year's fruiting cane on the grapevines so that healthy new shoots can grow for fruit production. Essentially, without proper pruning we wouldn't have grapes, and without grapes, we wouldn't have wine! I shudder at the thought! Since pruning is an essential part of vine care and maintenance, that means we have to consistently send our crew out to complete this process, regardless of the frigid temperatures and conditions. Not only when they're out among the vines, but even in our winery this time of year, the wine-making crew can be exposed to below average temperatures. 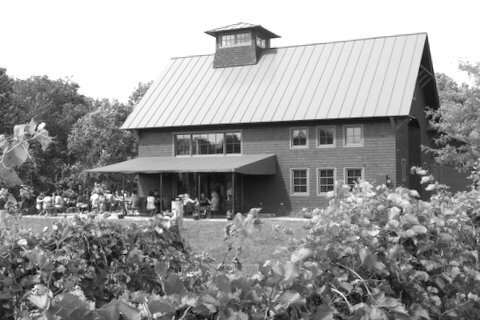 The wine being made does best in 50-60 degree Fahrenheit temperatures for stability and to prevent premature aging. Therefore, the thermostat must remain within that range, meaning working inside even requires thermal layers. But we certainly wouldn’t force our crew to work in the cold without providing boot warmers and plenty of hot coffee to keep them going. Winter work at the vineyard isn't always for the faint of heart. A lot of frosty faces, chapped lips, and icy hands go into making what we do here possible, and we wouldn't be here without all of their hard work. Ice Wine harvest is all fun and games compared to the other, sometimes grueling, winter work that our crew is oh so familiar with this time of year. Leave the grapes on the vine they say...let them freeze for a while they say...they'll make delicious wine they say. It's Ice Wine season around these parts and we couldn't wait to get our hands on those delicious frozen berries. Ice Wine is something we've been producing here for a while given our uniquely frigid climate. Our Vermont grown Ice Wine is made primarily from Vidal Blanc grapes, field blended with a small amount of Arctic Riesling. Although, I'll let you in on a little secret, we will be harvesting some Marquette grapes to use for a separate Ice Wine this year! We sent out a crew of staff and community members at the break of dawn on a frigid 12 ̊ Fahrenheit morning for harvest. The stems on the grapes are so brittle when frozen that the crew used an interesting technique of shaking the vines to release the grapes. Once the grapes fell into the netting, it was opened, and the grapes dropped to fill the bins below. Ice wine harvest is quick work as we want to make sure the grapes don't warm up too much in the process! What's so special about these grapes anyway, besides the fact that they are frozen? 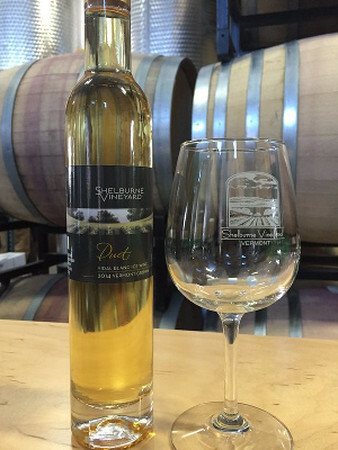 Well, due to the extended period of ripening, the frozen grapes harvested for Ice Wine have a much higher sugar content making them perfect for dessert wine! This sugar content is measured in units called Brix. This year the juice we harvested immediately from the frozen grapes held about 42 brix, we expect that the finished product will contain a residual sugar content between 20-23 brix. In case you don't know, that's some sweet wine considering our other, more typical wine only has 1-3% residual sugar! Not only does the sweetness make it special, but the sheer amount of grapes it takes to produce juice from frozen grapes is about 20% more than normal grape harvest. 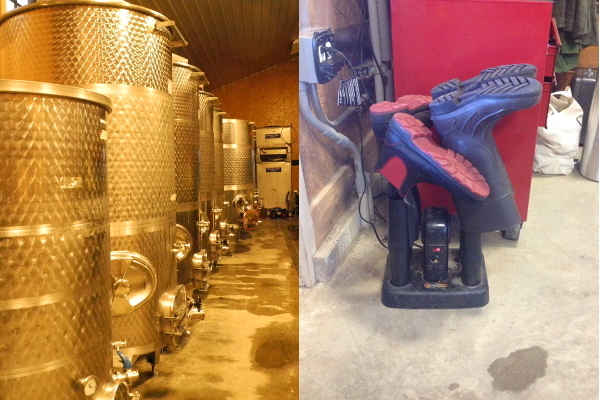 Out of the 1.6 tons of Ice Wine grapes harvested this year, we were able to yield only 184 gallons of juice. 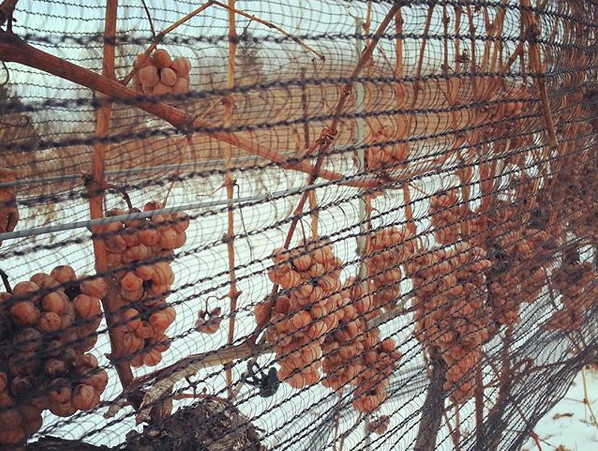 According to our head winemaker Ethan, it's looking like a good year for Ice Wine! He says a great ripening season, which isn't always achieved, allowed for an excellent development of flavor and aroma that will surely shine through in each bottle. "This machine will produce about 1000 bottles an hour"
With the crew operating the last bottling until next season, the pressure is on to make sure that this selection of Marquette perfectly finds its home in each bottle. While bottling doesn't happen quite often, it does involve many patient hands in the process (And not just robotic hands either). Some of these patient hands include the Vineyard Manager and Head Winemaker Ethan Joseph, tasting room manager and Gallery Coordinator Rhiannon Johnson, as well as our Vineyard Assistants Josh Stecker and CJ Buzzy. The bottling process simply begins as plain, empty bottles are lined up and sent down a conveyer belt into our handy and efficient "bottling machine". This machine is where a majority of our bottling is actually conducted. 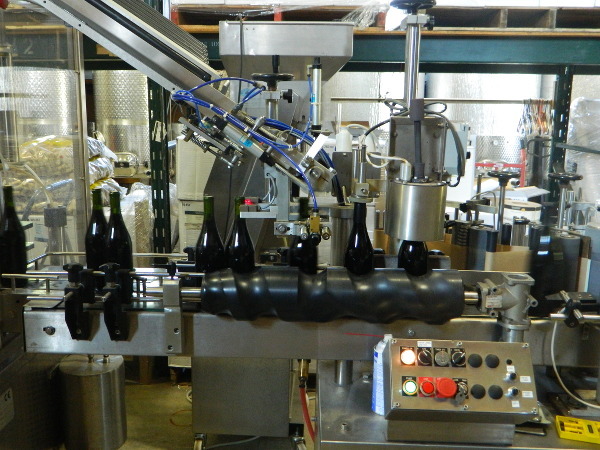 When entering the machine, the bottles are circled around on a carousel and pumped full of that good red stuff. Once they are precisely full enough the machine then corks the bottles and they move on down the line. We all know that little plastic wrapping we have to tear through in order to uncork and pour ourselves a glass; well that's the next step! PVC covers shoot down and are shrunk with heat to each bottle neck. Directly following, labels are spun around and stuck to each bottle. Once the completed bottles exit the machine, we need someone to catch them on the other side! 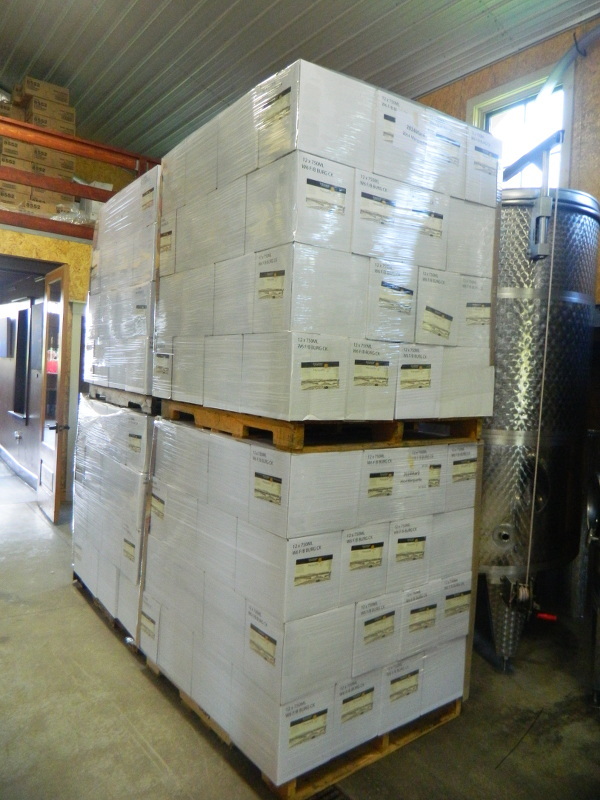 Strong arms needed for this job as the winery assistants lift and pack the full bottles into boxes and then stack those boxes onto pallets where they can be plastic wrapped and stored. Not only are they there to catch the bottles, but this is also a necessary step for quality control. Bottling wine requires a great deal of diligence and patience, something that our workers here are very experienced with. Now you can see how our beloved wine is transformed into the bottle you have on your wine rack at home. 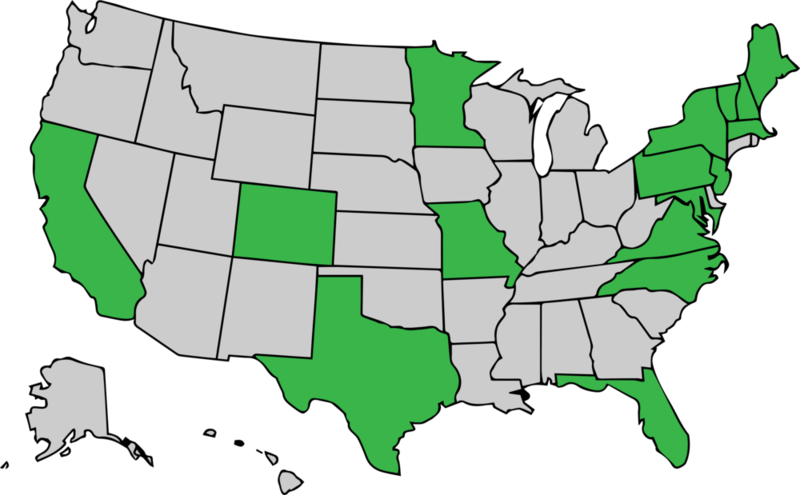 Come on over and experience a tasting, there's plenty of Marquette to go around!